The underlying causes of the Recession continue to manifest today. Amongst the most interesting articles I read this weekend was an article authored by Bruha and Podpiera for the Czech National Bank on the causes of Recession that started in 2008. The data-consistent model argues declining investment costs decrease the opportunity-cost to invest in other labour-intensive economies, underpinning the significant capital outflow from the US and (to a lesser extent) EU into Asia and lead a current account surplus. The paper suggests the main mechanism acting to increase consumption in the US and the EU was comparative cost and investment competitiveness in increasing returns activities of China. The productivity differential between US/EU and China, coupled with lower barriers to investment, led foreign firms to invest in labour-intensive, increasing-returns economies such as China and to satiate from those factories internal (in China), domestic and foreign demands. The Chinese economy thus increased exports and decreased imports and the opposite effect impacted investing economies such as the US or the EU. The effect was more pronounced as the investing economy was more productive as input savings (considering the Nordhaus framework) increase firms’ capacity to invest abroad. In a way, this observation implies Donald Trump may be correct when trying to repatriate US jobs, particularly as the production reallocation happens due to conditions exogenous to the US economy. Likely motivated by President Trump’s policy, US foreign investment flows to China were unchanged in 2017 while total FDI to China increased 1.2% from the previous year in September (chart below). While US capital flows are unaltered after restrictive tariffs, the productivity differential now benefits China. Expected wage increases may dampen investment – and befall China in a middle-income trap. 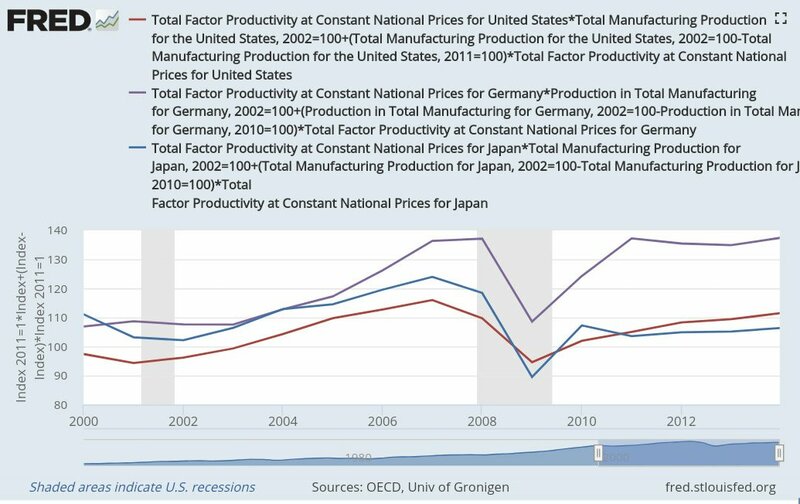 Germany’s productivity is surprisingly low in the plotted chart, below that of the US or the UK. 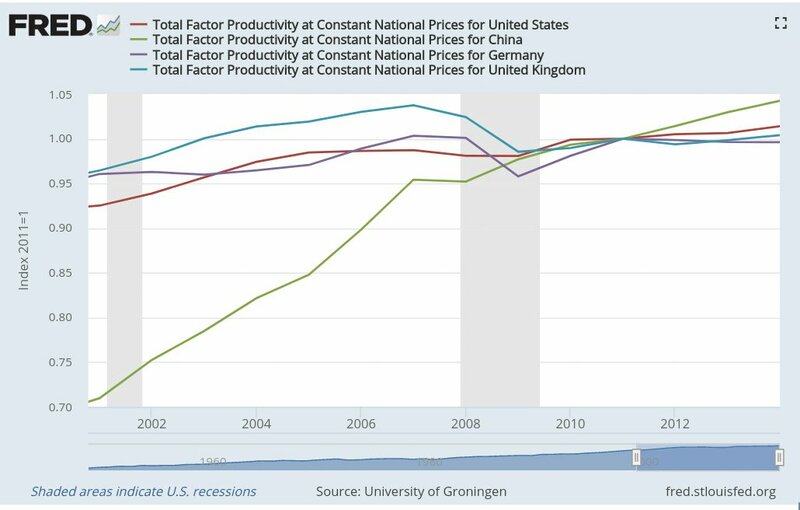 Nordhaus offers a productivity measurement that, by applying the Baumol effect (rapid output growth indicates higher productivity gains going forward), computes an ‘economic welfare’ productivity index : fast growing sectors indicate higher productivity. In those terms, Germany’s increasing investment in manufacturing leads to conclude its manufacturing investment is more welfare-enhancing than that in the UK or the US. Previous Article Is China in a middle-income trap?